The Honey Bees measure 21" from hands to feet and approx 9" from top of wing to belly. They are made using osnaburg cotton fabric, stuffed with fiberfill and painted with acrylics. 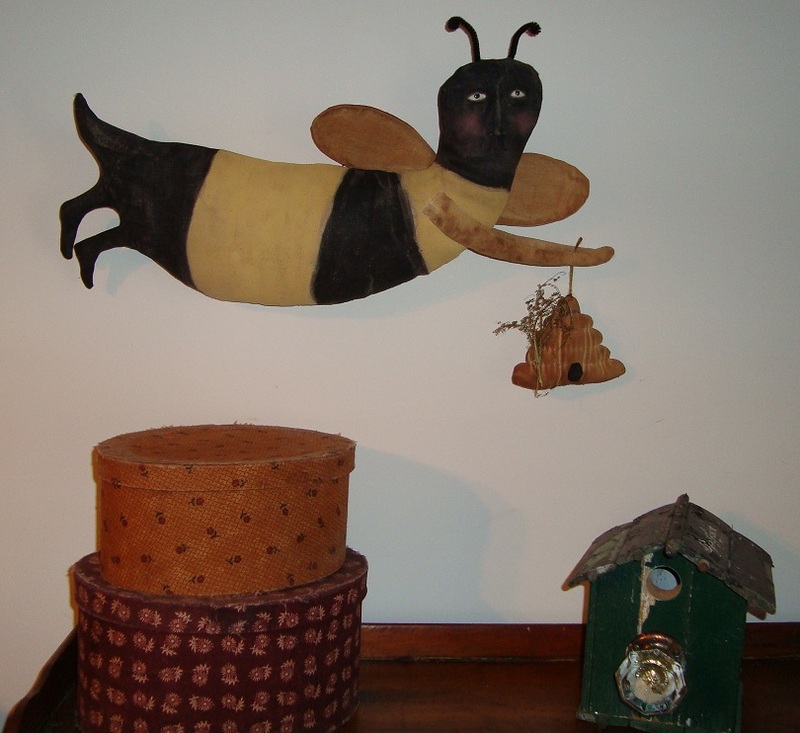 The wings and bee skeps are made using osnaburg and fragrant Sweet Annie is attached to the skeps. 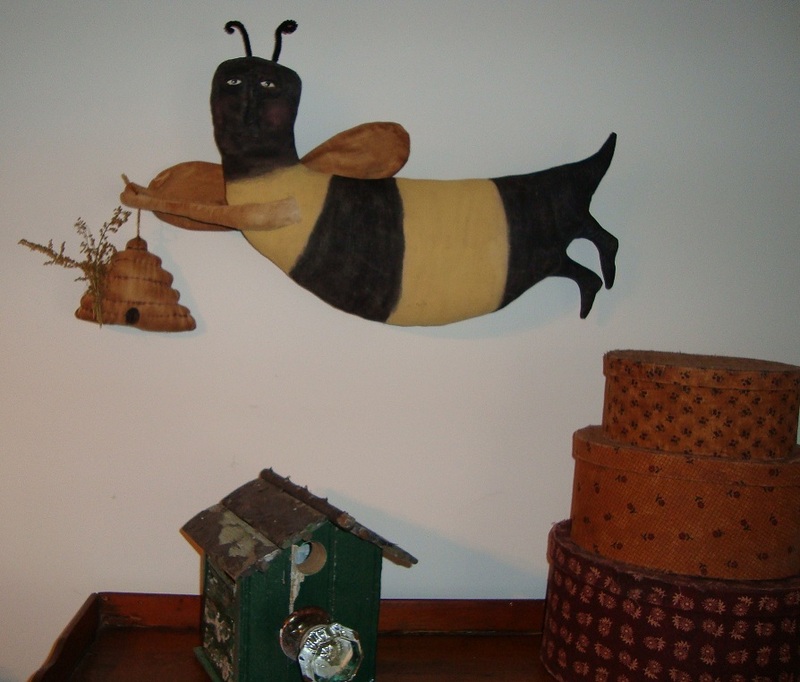 The antenna on the bees are made with black pipe cleaners. Yours for $65. plus shipping. This bunny was originally designed as a special order for a granddaughter who read and loved the book "The Miraculous Journey of Edward Tulane" shown beside Edward in the picture. Trying to stay true to the description in the book, Edward measures almost 36" from feet to top of ears. In the book Edward was porcelain with fur ears and tail. My version of Edward was made with a cloth face and limbs but coated with an artists mixture, painted then sealed with a gloss fixative to resemble porcelain. His clothes are removable and his fur tail sticks out beyond the opening in the back of his pants. True to the book, Edward does have a pocket in the front of his pants for you to tuck a pocket watch if you so choose. I also stitched a red heart pocket on his chest for a special message for the child. Edward has dots to represent whiskers and has painted rosy cheeks. If you would like to have an Edward Tulane of your own, please contact me to place an order. I may or may not have one in stock. In the event there is not one in stock, please allow up to 4 weeks for delivery. All inquiries are welcome since shows and workload vary. Edward is $145 plus shipping; shipping of the other rabbits were around $16. Book not included. These rabbits have been purchased by parents, grandparents and by teachers who have used them as a teaching aid for their elementary school aged children. Thumper the wittle wabbet is made of soft snuggly velour. He measures 12" from the top of the curve in the ear to the toes. Thumper is slightly weighted so he can sit. The jacket is made of velour and has a running stitch around the edges of the sleeves, neck and edge of jacket, with a vintage button at the neck. 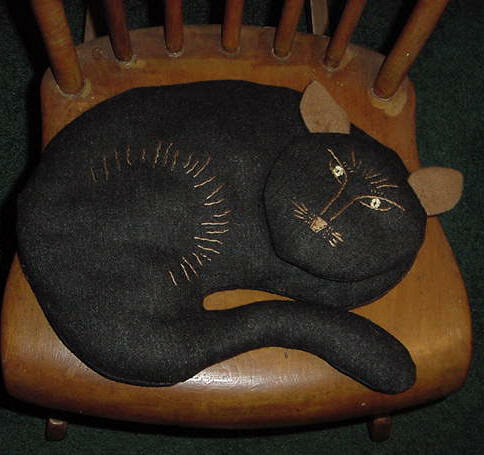 The facial features are stitched on with a blanket stitch and sisal whiskers. $35 plus shipping. A Velveteen Rabbit isn't just an Easter item; it is associated with a child's book by the same name, and would fit in with eclectic or antique furniture. The exterior fabric is tan velveteen with the inner ear a think pink wool. They measure 6" at the highest point on their back and 12" from tip of tail to tip of nose. 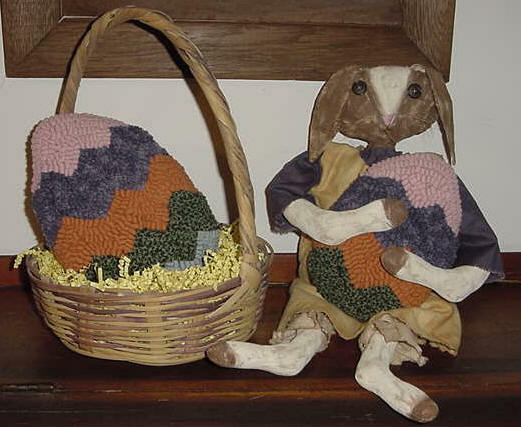 Each rabbit has black bead eyes and embroidered nose, with rayon ribbon around the neck. 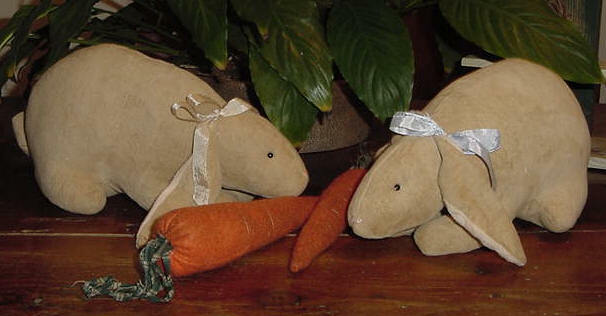 The carrots are made of felt with a little needle sculpting and homespun for the carrot tops. Sold separately, each rabbit with a carrot is $30 (shipping to be added). Egg in a basket ~ The egg is hooked using 1/4" wide wool strips with a solid piece of pink wool on the back and is stuffed with fiberfill. It measures 7.5" wide and 9" long and comes with the basket. Egg in the basket is $35. 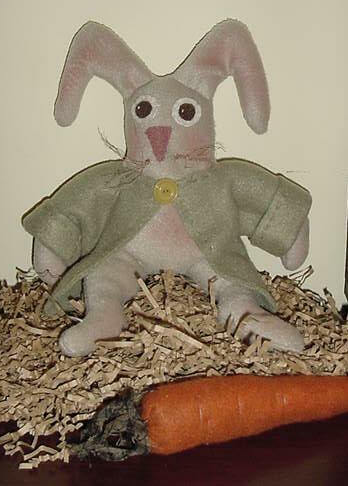 The Bunny has been sold but the egg in basket is still available. 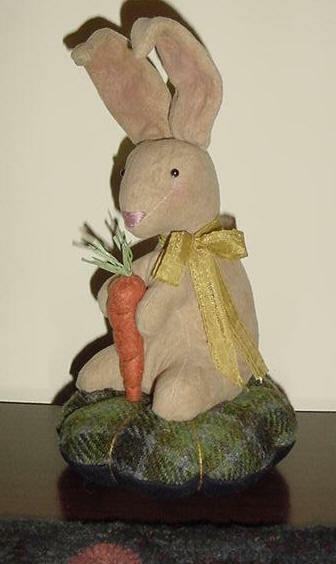 This standing Velveteen Rabbit is holding a little carrot and sitting on a tuffet. From base to top of head it measures 8 1/2". Not only is this a cute decoration but can also be used as a pincushion. Another Shari Lutz inspired design, the standing Velveteen Rabbit is $48 plus shipping. They look like Ying and Yang, but they're really Harley and Andy Pandy. Harley is dressed in green and Andy in red. They are 16" from toes to ears, made of cotton they have been painted with acrylics and stained with an antiquing solution. The vests are sweater knit with button closure. Sold individually for $40 each + shipping. If you would like to order one please contact me and I will make one for you. Depending on my workload or show schedule it may take up to two weeks. 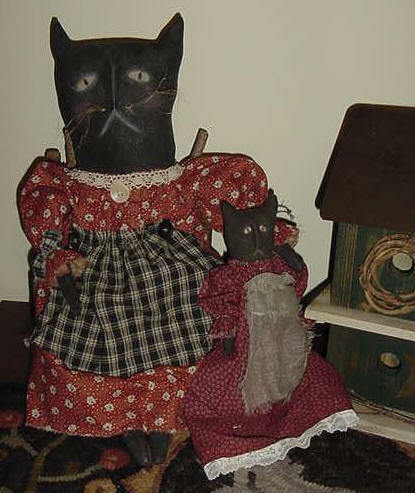 A Primitive Cat Cushion (pillow) I fashioned after an early 1900s pillow as shown in the book "Seasons" which was in the home of Messrs. Cramer and Johnson's Seven Gates Farm in Maryland. Made of woven wool with embroidery floss embellishment, the cushion/pillow measures 17" across from left to tip of ear on the right and 12" top to bottom from tip of ear to tail. This could be used at Halloween and all year round. $48 plus shipping. Ester is made of peach mohair, has glass shoe button shank eyes, embroidered nose & mouth and has 5 joints (arms, legs & head swivels). Ester measures 15 1/2" long (stretched out) from top of head to the feet. Ester sits in an olde timey Easter basket with 3 vintage Easter post card copies, a vintage oval doily, 2 olde little Peeps and 4 vintage looking paper covered eggs. 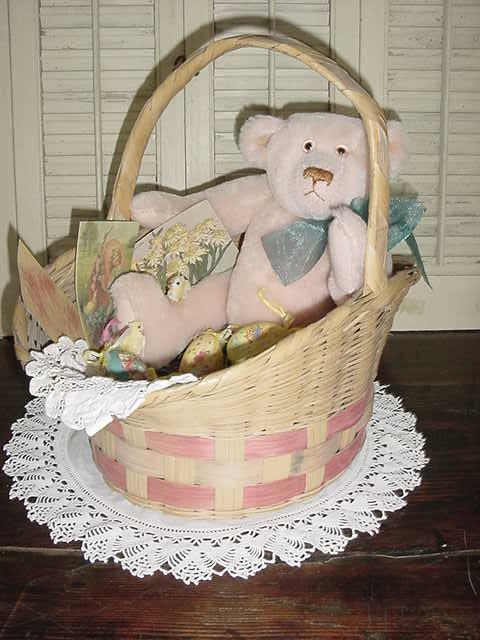 If you want to give a special non-candy gift to a child, something that will be a collectible, or if you have a college student who needs a special Bear Hug, then Ester and the basket contents will be a good choice. Ester is $95 plus shipping. Babe is a jointed blue mohair bear. Her bow is a delicate piece of vintage fabric and wears pearls. With her also comes the vintage basket, old tea cup, dainty napkin, doily, copies of vintage photographs and post card. BoBo the Clown is made of mohair, has jointed limbs and glass shoe button eyes. BoBo is 8" tall in his seated position to the top of his hat. The hat is a colorful vintage-looking stripe with orange pom-poms. His collar is an old crochet piece. BoBo is holding a clay hand sculpted clown face which has been painted with acrylics. $90 + shipping.